Cloud storage service makes it more easily and convenient for people to store photos and other files. It enables people to access to their files wherever they are as long as they can sign in their accounts. SkyDrive is one of the most popular cloud storage service. If you want to view and share photos in SkyDrive albums in slideshow, this is the right place you come. This article is about creating a fascinating slide show with SkyDrive album photos. 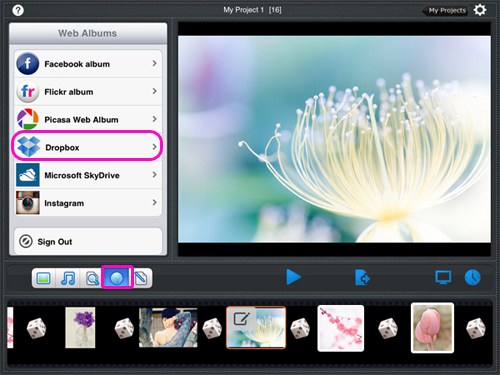 To turn SkyDrive photos into a slideshow, you need to have the aid of Photo Slideshow Director HD for iPad. It is an iPad slideshow app which can turn photos in Web Albums, such as SkyDrive, Dropbox, Instagram, Picasa into a stunning photo slideshow with music and kinds of effects. Step 1. Open Photo Slideshow Director HD on your iPad and create a new project. Step 2. Touch “Web Album” icon, you can see a web album list from which you can add photos to the app, including SkyDrive, Dropbox, Instagram, Picasa, Flickr and Facebook. Choose SkyDrive from the list. Step3. Sign in your SkyDrive account and enable Photo Slideshow Director HD to download photos from it. Enter your SkyDrive account user name and password, then touch “Sign in”. Step 4. Then photo albums in SkyDrive account will show. Tap the photo album to open photos, then tap photos to download them into the app. The “Add All” option enables you to download all photos in one album at a time. 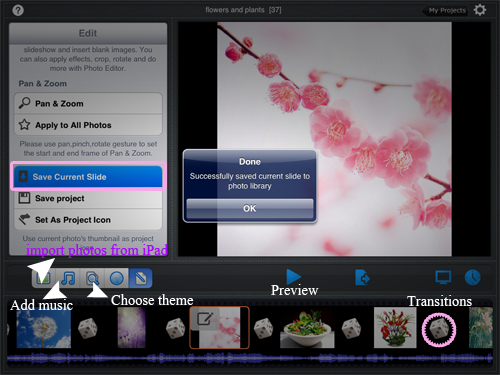 After adding SkyDrive photos to iPad slideshow app, you can fix photos with its photo editor, import background music, choose a theme, change transitions, do everything to make a fantastic slideshow on iPad. The iPad slideshow app enables you to save photos to iPad Camera Roll. Open the photo you want to save to iPad in the main window, touch the right icon next to “Web Album” and touch “Save Current Slide”. In Step 5, you have turned SkyDrive photos into a beautiful slideshow. After that, you can watch and share the photo slideshow. 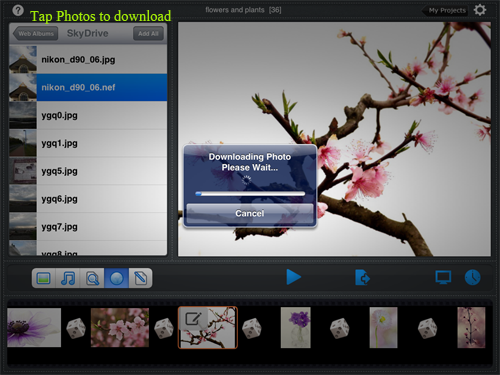 The app provides different ways for sharing finished photo slideshow.